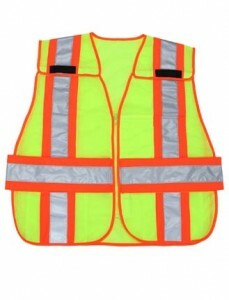 This vest is high contrast, triple trim, conforms to ANSI-ISEA specifications and is designed for public safety and highway workers. There are Velcro closures on the sides, shoulder and front to provide a five-point breakaway design. The material is polyester micromesh with contrasting trim. The two-inch 3M Scotchlite reflective trim allows the vest to have 360 degrees of reflectivity. R & B Fabrications Inc.